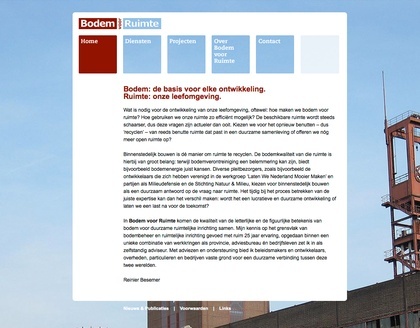 VisualSpace realizes the website for Bodem voor Ruimte. On the website a passionate plea to improve the way our urban environment to get started. What is needed for the development of our environment, or how do we make ground for space? How we use our space as efficiently as possible? The available space is becoming scarce, so these questions are more topical than ever. Do we choose to reuse - recycle - the already utilized space that fits a sustainable society, or we sacrifice even more open space? Urban construction is the way to accommodate recycling. The soil quality of this area is of great importance: while soil pollution may be an obstacle, soil energy offers opportunities. Several advocates, such as developers who have formed the group Let's Make The Netherlands Beautiful and parties like Milieudefensie and the Stichting Natuur & Milieu, choose for urban construction as a sustainable response to the demand for space. The timely inclusion of the proper expertise can thus make an identifiable difference: is the development lucrative and sustainable, or do we leave our problems to the next generation?